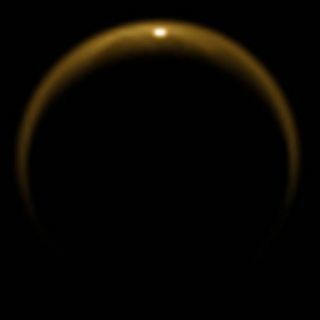 Scientists have shed new light on how Saturn's largest moon Titan gets its soupy smog. Thought to be similar to what Earth's atmosphere may have been like billions of years ago, the reddish-brown haze surrounding Titan could provide an example of how aerosol layers behave on our planet. Using observations from NASA's Cassini spacecraft, which regularly flies by Titan, scientists found out that solar radiation hitting molecules of nitrogen and methane in the moon's ionosphere (the upper part of the atmosphere) creates a mix of negative and positive ions. These ions then crash into the organic molecules and help them grow into bigger and more complex aerosols, the researchers found. "Lower down in the atmosphere, these aerosols bump into each other and coagulate, and at the same time interact with other, neutral particles," a statement from NASA read. "Eventually, they form the heart of the physical processes that rain hydrocarbons on Titan's surface and form lakes, channels and dunes." Titan is dotted with liquid hydrocarbon lakes and it's the only other body in the solar system besides Earth that is known to have stable liquid on its surface. The new research — led by Panayotis Lavvas, a France-based scientist participating in the Cassini mission — was detailed this week in the journal Proceedings of the National Academy of Sciences.